The second-ranked UVa. baseball team finished off a three-game ACC series sweep of Virginia Tech with a 7-4 victorySunday afternoon at a blustery Davenport Field. 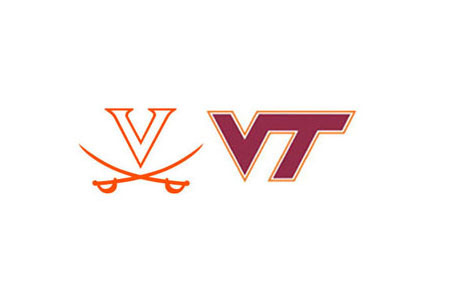 Virginia (23-4, 10-2 ACC) scored four runs in the seventh inning to take the lead for good en route to its seventh series win over the Hokies (12-12-1, 5-7) in nine tries since Virginia Tech entered the ACC. Mike Papi (Jr., Tunkhannock, Pa.) went 2-for-4 with the game-tying RBI in the seventh inning; he was 6-for-10 in the series. Joe McCarthy (So., Scranton, Pa.) hit a two-run triple and finished the series 5-for-11 with seven RBI. UVa reliever Whit Mayberry (R-Sr., Alexandria, Va.) earned his second win of the weekend and improved to 3-1 with 1 2/3 innings of relief. Nick Howard (Jr., Olney, Md.) worked the ninth for his eighth save in as many tries. Virginia Tech reliever Sean Kennedy (1-1) took the loss after failing to retire any of the three batters he faced in the seventh inning; all three came around to score (one earned). Virginia starting pitcher Brandon Waddell (So., Houston, Texas) worked 6 1/3 innings, giving up three earned runs, six hits and no walks while striking out five. Virginia Tech starter Jon Woodcock pitched five innings, giving up three runs (two earned), three hits and four walks while striking out four. Virginia jumped ahead quickly with a pair of first-inning runs when McCarthy launched a high fly ball into the wind blowing out to right-center field; the ball carried and bounced off the wall for a triple, scoring Papi and Brandon Downes (Jr., South Plainfield, N.J.). UVa tacked on a run in the third as Papi led off with a single, stole second, moved to third on catcher Mark Zagunis’ throwing error and scored on a Downes groundout to shortstop. Luke Scherzer came in to pitch and after Zagunis committed a passed ball to put runners at second and third, Downes popped out to short right. McCarthy was intentionally walked, and Papi was thrown out at the plate on a grounder to third by Robbie Coman (So., Lake Worth, Fla.). Nate Irving (Jr., Yonkers, N.Y.) grounded to third but it was booted by Matt Dauby to allow the go-ahead run to score. Scherzer then plunked Kenny Towns (Jr., Burke, Va.) and Tony Butler (Fr., Sun Prairie, Wis.) with consecutive pitches, with each forcing home a run. Virginia has a busy week ahead, with five games on the docket. The Cavaliers play host to a pair of midweek games, taking on Old DominionTuesday and George Washington Wednesday. Both games start at 5 p.m. UVa travels to Pittsburgh next weekend for a three-game ACC series with the Panthers, who have won six straight ACC home games over the last two weeks and currently boast an 18-game home winning streak.